My drink of choice, you ask? For me, it really depends on the social situation. For example, if it's Bachelor Monday, I prefer a nice red glass of wine. If I'm at a wedding I love some bubbly champagne. If I'm on a beach, I love a sweet cocktail with umbrellas and fruit! Although I try not to care about calories, lets face it, I do! And we all know that margs are packed with calories and sugar...booooooo. 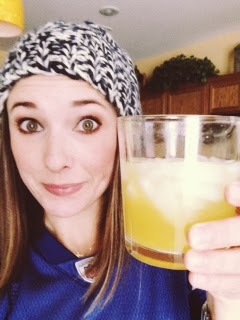 Don't fret my friends, I've created a seriously marvelous skinny margarita. Mix together in a shaker, add salt or sugar to the rim, and pour over ice. Makes 2 servings.